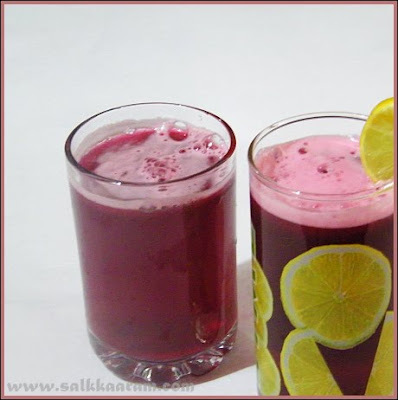 Beetroot Juice | Simple and Delicious ! When my sis introduced me this "juice", I didn't like the taste and added a good amount of lemon juice and sugar to consume it! :) Having that much sugar is not good, but taking Beetroot juice is good for you, it reduces blood pressure within hours! 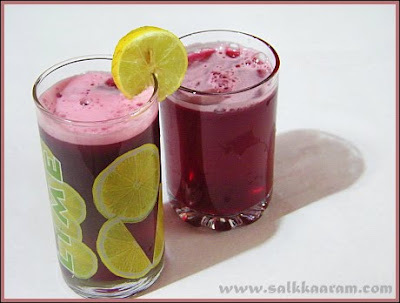 Beetroot juice is also a well known "powerful juice" that reduces the risk of the heart diseases.. Prepare it with or without lemon juice / ginger / cardamom and sugar, and enjoy a very healthy drink! Blend beetroot with water and sugar. Strain and add lemon juice according to your taste.